wwwooowww, now I`m still laughing here ;-))). what a surprise - thank you. Meg, how cute is his shirt?! Your craft fair looks like a complete success - what a lovely sunny day! I had begun to wonder where you were hiding, then I realised you were preparing that amazing stall - great job!!!! What cute little dolls...are those John Deere tractors on his shirt? 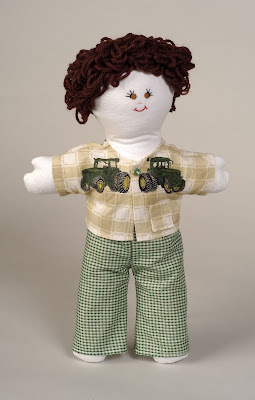 Hi Sally Anne, Yes, he's my little John Deere boy. The back of his shirt says John Deere!